I was wondering if anyone had any pictures of where they have mounted their rotisserie in the front and back? Close ups would be great if possible. To further clarify, my car is a LWB 1972 so I don't have the later impact bumper points for attachment. Sorry for the crappy pic, it's all I have access to this AM. Simply use the front bumper to body mounting points. BTW, the blue is tinted primer, not paint! Hope this helps. I modified my bumper shocks to have a threaded bolt and drilled the rotisserie to bolt it on. It added some extra space to the front and rear which was very helpful when welding. Thanks for the picture. Do you have any pics of the back attachment? So it likes you just simply attached to the motor mounts in the back? I used the 2 quarter bumper threaded inserts in the frame rail. 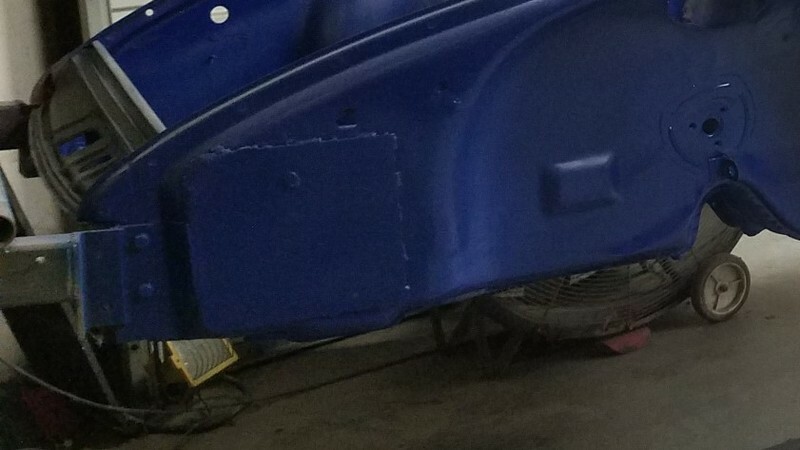 For the rear mount to the chassis - I fabricated a frame that was deep enough to clear the rear fiberglass bumper and to line up with the front mount. To attach the frame to the chassis I used an old set of engine mounts and the through holes in the chassis for the fender supports. I used 3/4" threaded rods and large washers to attach the tube to the through holes. I fabricated another frame that picked up the front suspension mounts. I also modified the arms on the arms on the rotisserie to crate "hinges" on each of the arms. This allows me to lift the front or rear of the car independently without loading up the chassis.